Four years after her poignant Family Games (1994, etc. 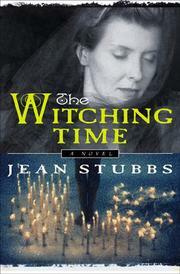 ), Stubbs returns with a subtly shaded, quietly insightful story of a young English widow who moves to the country for a fresh start, only to find herself in the middle of a pitched battle between the forces of light and darkness when she befriends a local group of witches. Imogen is still at sea after the loss of her beloved, Fred the toymaker, when she encounters old chum and protector Alice in London, and quickly accepts Alice’s offer to come north to stay with her and her minister husband. Something in the dales surrounding Alice’s town touches Imogen deeply, and one day when she hikes to nearby standing stones known as the Listening Women, she comes back with resolve to get on with her life. Being independently minded as well as gifted, she moves to the village beneath the stones and opens a made-to-order hat shop without consulting Alice, to find herself connecting with other craftswomen, all of whom happen to be witches. Drawn to the dark, magnetic Philip, who runs a home for juvenile offenders, but warned about him by the genial, wise old Dr. Rowley, local specialist in magic arts, Imogen tries to keep her distance—which proves hard once both she and Philip are leads in the Elizabethan drama the good doctor is staging to benefit the church. Meanwhile, Imogen has another fan in George, the play’s set builder, the church’s bell-ringer, and the illegitimate son of Mary, the grand old witch of the dales. When matters come to a head on the play’s opening night, Imogen has already made her choice, but face-to-face with evil she also finds a strength that will change her life forever. A bit of a slow burner, but the conflicts in a tender woman’s heart are neatly conveyed here, as is the sense of a close-knit community with more than its share of secrets to hide.